Adrian Leppard dissects and discusses the role that the traditional Police force can play in combating cyber crime. He looks beyond this to examine where the law is leaving people unprotected. 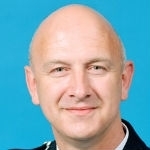 Adrian is a senior British police officer and the current Commissioner of the City of London Police.